The Mark VIII A27M Cromwell V (RP-3) (or just Cromwell Mk.V (RP-3)) is a Rank II British medium tank with a battle rating of 3.3 (AB/RB/SB). 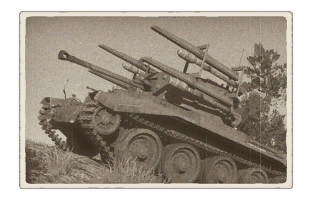 It was introduced in Update 1.59 "Flaming Arrows". Equipped with four 152 mm RP-3 rockets with a relatively straight trajectory, the Cromwell RP-3 could be played with more precision than its other rocket-bearing contemporaries like the T34 Calliope. The Cromwell RP-3 is very similar to the Cromwell V in terms of armour, mobility, and armament. The 75 mm gun can help do damage to tanks of the same class like the Panzer IV, using its speed to get to an angle to hit the weaker points of the enemy tanks. However, the Cromwell RP-3 is equipped with four rockets on the turret. Unlike its contemporaries, which often has the rockets on racks above the turret, the rocket integrated on the turret allows for better aiming with the rockets in-game than the others. In the range of around 500 meters, the rockets can be aimed by use of the gun's aiming sight. Though practice is needed to get the feel of the rocket's landing point, this is a lot better than simply lobbing rockets after rockets in hope that one will hit. Rocket racks on the turret are 25 mm thick gun steel. 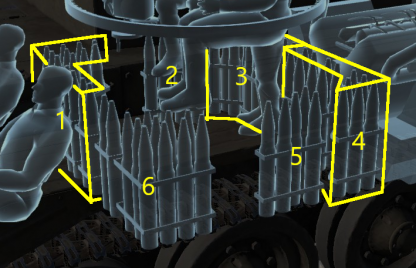 Ammo racks of the Cromwell V.
The Cromwell RP-3 should not fight tanks in a head-on battle due to the relatively unsloped frontal armour. As such, the mobility of the Cromwell should be exploited to get to the blind spots of an enemy tank and fire at them from there with the 75 mm gun or the rockets. The Cromwell fighting prowess is due to its manoeuvrability and gun rotation. This is thanks to the combination of the Rover Meteor engine, essentially a Rolls-Royce Merlin of Spitfire fame with the supercharger removed, and its Merrit-Brown triple-differential transmission. This gives the Cromwell power even while it manoeuvres so it maintains speed much better than those tanks using traditional clutch-and-brake systems like practically everything in this BR. This not only allows it to spin in place and easily run around obstacles, but it can also out-climb almost every tank in the game, allowing it to go places the enemy might not expect to find you. But mostly this gives it unmatched speed, allowing you to reach the good sniping spots before anyone else in the match. But there is a down side to the Cromwells amazing speed, Going in reverse will only let you go up to 3KM/h, and rarely will you be able to damage a tank enough to get a similarly effective second shot; either the tanks was still drivable and retreated to cover, angled to best bounce your next shot, or 1 shot you in return with APHE. 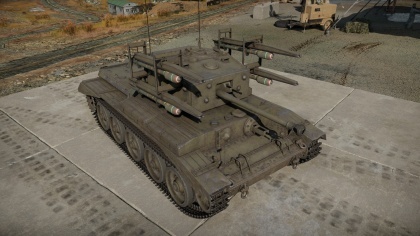 Once upgraded, the Cromwell's turret rotation is one of the best for the rank, only beaten by the T-34 that has a rotation speed of 29°/s (fully aced crew). This allows an upgraded Cromwell to quickly engage targets in different angles, important for close-quarter fighting. German tanks will come close to you but not be able to catch up with you in some situations, but this being said; do not go into the hell of battle thinking "My turret rotation is fast enough to best all of youse!" because that will get the Cromwell destroyed by a tank who only needs to hit your turret from the front to disable you. And as said before your reverse speed isn't that fast so if you are in this situation all you can do is pray and hope that your team mates come up to help you out or in worst case scenario the Cromwell gets destroyed straight away from a side on hit. But instead help out the team from a distance of around 0-550m or if you feel like sniping from a distance your max range is 850m. The downside to this tank is its thin hull armour, especially on the sides. Everything on the map can penetrate the Cromwell hull, even from the front. This includes SPAAs, who will easily tear the Cromwell apart, especially the Wirbelwind that will do so at almost all ranges typically encountered and any angle. The Cromwells turret is somewhat better off, with just over 60 mm on the front and sides, but the flat plates are easily penetrated by any type of shell. The closely packed interior means it's a one-hit-to-burn design for anything with a 75 mm, and at 3.3 BR these will be on almost all tanks you face. Keep moving! If you take a shot or get shot at, re-position, don't ever try to fight it out. You're so much faster and more manoeuvrable than anything you meet that you can almost always find a better location to go after any target. Just don't try to reverse; it's single reverse gear gets you 2 mph (3 km/h), meaning you're likely better off spinning in place and then driving away. Very fast for a medium tank. 75 mm is a good gun in lower rank games. RP-3 rockets are able to destroy enemy tanks at long ranges. RP-3 rockets can be very accurate when learned how to use them effectively. Above 2 combined make it excellent for seizing zones and destroying the lighter tanks from other nations that are usually the first there. With judicious use you can often end up with the most formidable tank in a lower ranked game. Armour is able to withstand powerful rounds at long distances. Very good reload time, pending crew skill and experience. Not well armoured for higher rank combat, and the 75 mm gun is marginal. Sensitive steering in forward gears; very prone to fishtailing and spinning out. Boxy, vertical armour on hull and turret makes angling critical. Can be penetrated easily at close range. Can take some time to learn how to use it effectively. Rockets can be hard to aim at first. Rocket racks cannot be adjusted by elevation. RP-3s can only damage heavily armored targets with direct hits. Development for the tank started back in 1940, just around the time the Crusader cruiser tank was being put into service in the British Army. The development of a stronger cruiser tank was initiated due to the belief that that the Crusader would become obsolete in the face of more advanced German tanks as the time pass. The initial plans was for the tank to mount the OQF 6-pounder gun and was to be completed in 1942. The project was taken up by three companies who submitted their designs. Vauxhall developed the A23, a scaled down Churchill tank with 75 mm of armour and a 12-cylinder Bedford engine. Nuffield developed the A24 based off the Crusader that was powered by the Liberty engine and had an advantage of being put into production quickly. Leyland and Birmingham Railway Carriage & Wagon developed a design that was similar to Nuffield's, but with different suspension and track designs. All these designs were examined in January 1941 and it was decided that Nuffield's A24 would become the vehicle of choice for the project. Six prototypes of the vehicle, now called Cromwell I were ordered for delivery in the Spring of 1942, but arrived four months late, with current events making the tank designs outdated. Despite that, the tank was put into production and experienced an unsatisfactory performance history as being an under-powered tank. The lack of available tanks led to the demands for more 6-pounders on the battlefield, which were used to be mounted on the older tank designs. When Britain entered the war, Rolls-Royce stopped producing cars and set up a team to find ways to use their production lines. The team was made under Roy Robotham at Clan Foundry near the city of Belper. Meeting with Henry Spurrier of Leyland, they talked tank designs and a project began of fitting a Rolls-Royce Merlin engine onto a tank. A Leyland-built Crusader was used for the test, removing the supercharger from the engine before installing it in the tank. The result was an absurdly fast tank, able to reach a speed of 80 km/h, estimated since timing the speed runs was difficult. The impressive performance had Leyland organize a production for 1,000 units of the engine, renamed as the Meteor. This plan was changed after concerns of the engine's cooling was raised, Leyland decides to produce their own version of Meteor which was weaker (350 hp) compared to the Rolls design (500 hp). Thus, the Tank Board decided to just order the engine straight from Rolls-Royce for the Meteor engine. The A24 tank design with the Meteor engine was redesignated as the A27. During the development, Leyland suggested that the tank should be made to fit both the Meteor and the American-designed Liberty engine, thus the designation expanded to A27M (Meteor) and the A27L (Liberty) and were called Cromwell III and Cromwell II respectively. Leyland's attempt at building their own engine was abandoned. The A27M tank was made into a prototype and delivered on January 1942, it proved extremely mobile with its 600 hp engine and orders were placed for both engine versions. This proved difficult due to production difficulties with the Meteor and soon Leyland took over production of both versions. Production lines for the Meteor engine continued to be strained until late 1942, where Ernest Hives of Rolls met with Spencer Wilks of the company Rover made a deal in January 1943 to exchange factories, with Rolls establishing a Meteor engine factory at Barnoldswick, Lancashire. Production of the tank began in November 1942 with new names given out the the tanks. The original A24 Cromwell I from Nuffield was renamed the Cavalier, the Liberty powered Cromwell II became the Centaur, and the Meteor powered Cromwell III retained the name as the Cromwell. The actual Cromwell tank production was delayed until January 1943 due to low supply of Meteor engines until the Rover factory began producing it. With more Meteor engines being produced, the Centaur tanks were often converted to use the Meteor engine, turning them into Cromwells. Field tests with the tanks took place in August to September in 1943 alongside the M4A2 and M4A4 Shermans. The tests proved the Shermans to be more reliable than the Cromwell and Centaurs, needing only about 0.03 hours of mechanical attention every mile compared to the Cromwell's 0.07 hours per mile and the Centaur's 0.08 hours per mile. The two tanks were thus given time to iron out these deficiencies, the Cromwell suffered from oil leaks along with brake and clutch failures. While the tank suffered from these defects, the crews expressed their satisfaction of the designs for their speed and handling, but the Centaur was not given the same attention as the Cromwell. A second test in November had the Cromwell perform with improved results while the Centaur was still experiencing the same problems. The production model was finalized on February 2, 1944 after a specifications for a "Battle Cromwell" came in from Leyland, which included some design changes, an increase of 6 mm on the bottom of the tank, seam welding the joints, and the standard usage of the Meteor engine and the Merritt Brown transmission. The Centaur was relegated to training roles or modified for specialist roles such as anti-aircraft guns or engineering vehicles. Total production for the A27 tank series is 4,016 tanks, of which 950 are Centaurs and 3,066 are Cromwells. The Cromwell's frame used a riveted construction in its initial production models, but this later changed to welding. The frame was strengthened with bolted armour plates. Companies involved in the A27 production were LMS Railway, Morris Motors, Metro-Cammell, Birmingham Railway Carriage & Wagon Company, and English Electric. Some of these models were not consistent in construction, such as some variants built with 360 mm wide tracks and some with 393 mm tracks. Suspension was the Christie suspension derived from the earlier cruiser tank designs. Four of the tanks's road wheels have shock absorbers, and no return rollers are available, the tracks are supported on the top of the large road wheels. The gearbox has five forward and one reverse gear, with the first forward gear made for confined areas and sharp turns. While the Meteor engine is capable of going faster, it is restricted to 540 hp output with a governor to avoid straining the engine and suspension. The Cromwell's armaments changed over a few times, it's initial model mounted the 6-pounder gun, but the later models mounted the 75 mm gun. The adaption was easy due to the 75 mm gun being a 6-pounder bored for the larger caliber. A 7.92 mm BESA machine gun was available for coaxial firing on the turret. The armour on the Cromwell started as a 76 mm plate, which increased gradually to 83 mm and 100 mm over time for additional protection. The A27M Cromwell V was Cromwell variant that used the 75 mm gun and a welded construction, no riveting was used in the frame. This page was last edited on 16 March 2019, at 18:33.